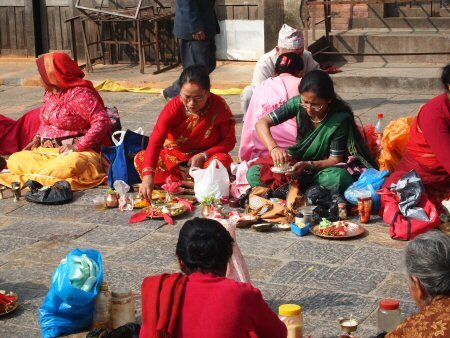 This is a free day in Kathmandu. 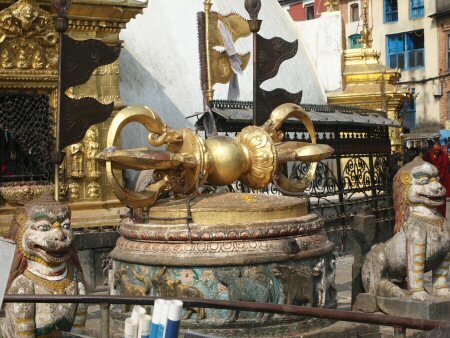 I want to see the monkey temple, Swayambhunath, so I get instructions on how to get there by taxi. 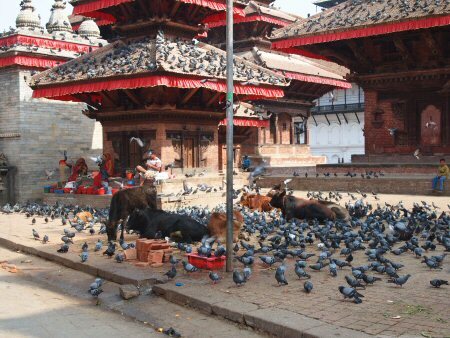 Some others want to see Durbar Square (Kathmandu) which is in more or less the same direction. After talking it over, most of the group decides they want to go one place or the other, so we agree to get a van and a guide and to go both places. This worked out really well. The van was much more convenient than a taxi, and the guide added immeasurably to the experience. Swayambhunath is a big hill on the outskirts of town, with the temple at the top. A long stairway leads to the top from down below, but our guide knew another way where we could get up almost to the top on the bus. Already he was worth it. 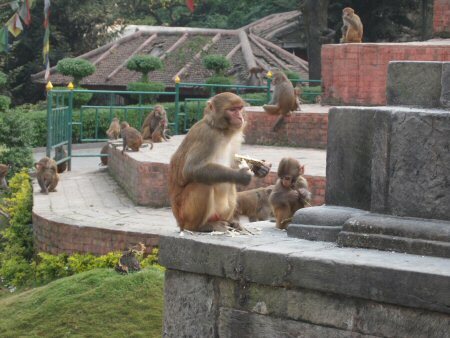 There were indeed monkeys everywhere on the temple grounds. They seemed to be leaving the people pretty much alone, and the people were steering clear of the monkeys. Up on top, at the temple itself, there were numerous shrines, memorials, and other distinct places. Our guide explained many of these: one was a monastery where students would spend three years, three months, and three days, and emerge with a degree of some kind that would allow them to perform ceremonies. Another was a temple to the goddess of mothers and children: many people were lining up to pray there, and to have to local shaman perform ceremonies and rites for their loved ones. In another corner of the square there were a few dozen women linking up for an upcoming ceremony. This is something that happens once a year, and happened to be taking place the day we were there. Each woman had dozens of ingredients of various sorts, and during the ceremony a priest would call out instructions on what to do with what ingredient, and they would all do it. We did not actually witness the ceremony itself, just people getting their stuff ready. In another corner was a magic well, where people looking down would see the future. A certain number of these people would despair, and fling themselves to death down the well. The King eventually had the well sealed. After this we went to Durbar Square, Kathmandu. The third of the palace squares in the Kathmandu valley, this is now in the center of the city. It had the usual assortment of wooden pagoda-style temples, massive moorish temples, and even a Georgian style palace built by the English as a gift to the King. Off to the side we went into the compound of Royal Kumari, the living goddess. This is a young girl, chosen from a Buddhist family, who upon being chosen becomes a Hindu deity. She lives in the palace, taken care of by members of another family, who has had this job for many generations. Her traditional role is to advise and support the King, whose divine power derives in large measure from the godess. She never sets foot on the ground, and only leaves her residence three times a year for important ceremonies. As soon as she reaches puberty, she retires and can go back to her family, and another girl is chosen. While we were there Kumari was eating lunch, so we did not get to see her, but she regularly appears at the window and waves to visitors. 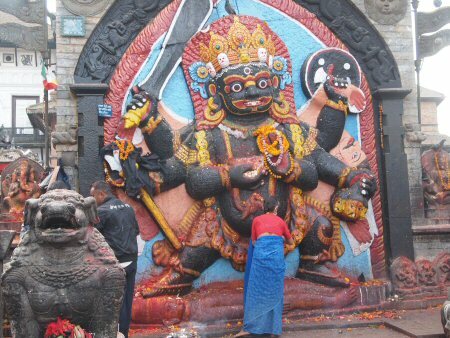 This Durbar Square had a big statue of Kala Bhairab, painted black and destroying its enemies. Lots of people seemed to be praying to, or at least paying respects to Kali. This deity of destruction seems to play a pretty important role in things, more than I would have guessed.